If you have an online presence you probably of already heard of SEO and how important that is to getting good search rankings on Google and Bing etc. SEO can be a bit of a complicated field. Follow these 5 simple steps to start down the road of improving your sites search engine rankings. Don’t ignore Local SEO. Local SEO is focused on providing results that are relevant to a searcher based on their current location. 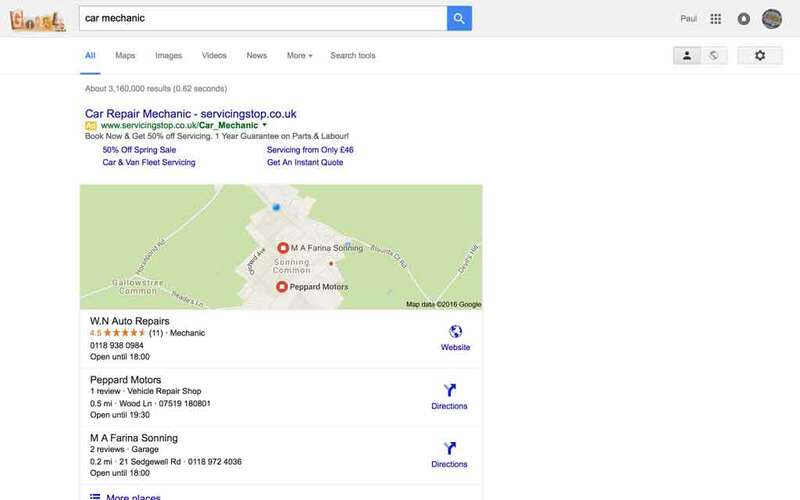 For instance, if you were to search on ‘car mechanic’ on your desktop right now, Google would provide you with a list of results that are nearest to you. From the screen shots, you see that my results have a map with business locations nearest to Peppard Creative. Note it is possible to set your search location at the bottom of the google search page if results for the wrong location show up. Some ways you can make sure your website features in a local search is to ensure that you have set up a Google page for your business, also that your website is listed in all the local directories such as yell.com, Thompson local and scoot. Content is king A website’s content, even more so than its products or services is what attracts your websites visitors. If you can’t write the good content yourself, think about using the services of a copywriter. Your content should be interesting and relevant to your target audience and free from embarrassing typos. Also, try and write for humans and not for search engines.
. All of this leads nicely on to point 3. Regularly update your Blog. Search engines love Keep content fresh, unique, and interesting. So if you haven’t already thought about it a blog is a great way to regularly introduce new content for your prospective customers and retain existing ones. Try and blog regularly so that your website always has fresh content. Google’s Webmaster Tools are essential for any strong SEO effort. Use google webmaster tools to ensure that your website is being indexed correctly, correct any potential errors as soon as possible. Google Webmaster Tools provides useful insights to what’s getting indexed, what’s getting linked, and what pages are getting traffic. Make sure all your websites are using the meta tags appropriately and images use alt tags correctly. The importance of meta tags is that the search engines read them in order to compare if the title and the description are related to the visible content on your website. Try and use keywords in your meta description tag with no more than 150 characters in the meta description tag.